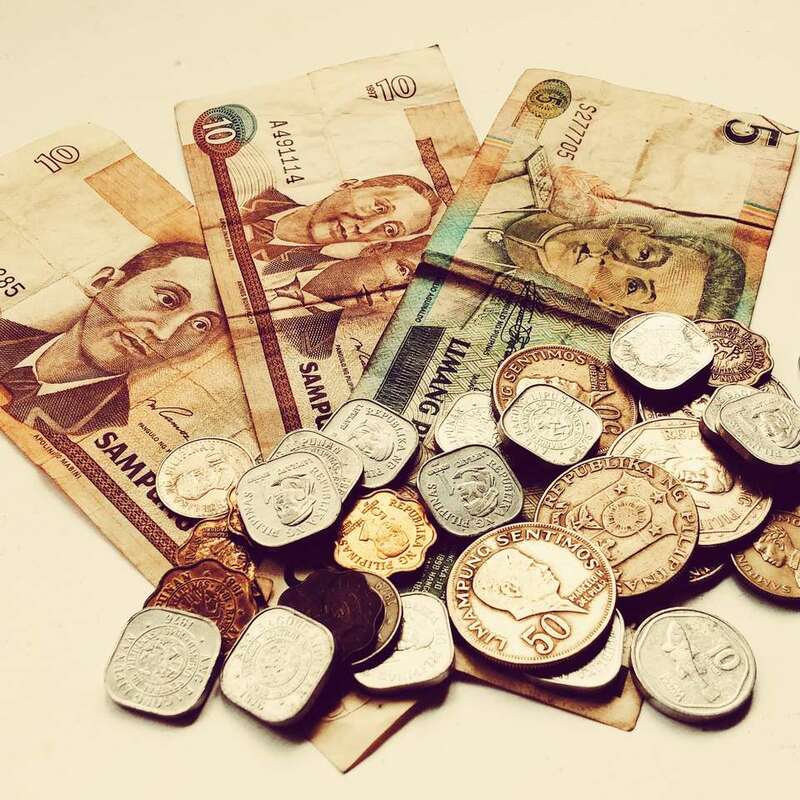 Managing money in the Philippines while traveling is simple enough, however, there are a few caveats of which you should be aware. As when entering any new country for the first time, knowing a little about the currency beforehand helps to avert scams that target newbies. The Philippine peso (currency code: PHP) is the official currency of the Philippines. The colorful notes come in denominations of 10 (not common), 20, 50, 100, 200 (not common), 500, and 1,000. The peso is further divided into 100 centavos, however, you'll rarely deal with or encounter these fractional amounts. Currency printed before 1967 has the English word "peso" on it. After 1967, the Filipino word "piso" (no, it isn't referring to the Spanish word for "floor") is used instead. U.S. dollars are sometimes accepted as an alternative form of payment and work well as emergency cash. Carrying U.S. dollars while traveling in Asia is a good idea for emergencies. If paying a price quoted in dollars rather than pesos, know the current exchange rate. Tip: While traveling in the Philippines, you'll end up with a pocketful of heavy coins, usually 1-peso, 5-peso, and 10-peso coins — keep them! Coins come in very handy for small tips or paying jeepney drivers. Outside of larger cities, functioning ATMs can be frustratingly difficult to find. Even on popular islands such as Palawan, Siquijor, Panglao, or others in the Visayas, there may only be one international-networked ATM located in the main port city. Err on the safe side and stock up on cash before arriving on smaller islands. Using ATMs attached to banks is always the safest. You stand a much better chance of recovering a card if it is captured by the machine. Also, ATMs in lit areas near banks are less likely to have a card-skimming device installed by thieves. Identity theft is a growing problem in the Philippines. Bank of the Philippine Islands (BPI), Banco de Oro (BDO), and MetroBank usually work best for foreign cards. Limits vary, but many ATMs will only dispense up to 10,000 pesos per transaction. You may be charged a fee of up to 200 pesos per transaction (around US $4), so take as much cash as possible during each transaction. Tip: To avoid ending up with only 1,000-peso banknotes which are often difficult to break, end your requested amount with 500 so that you at least receive one 500-peso note (e.g., ask for 9,500 rather than 10,000). Traveler's checks are rarely accepted for exchange in the Philippines. Plan on using your card in ATMs to get local currency. For additional security, diversify your travel money. Bring a few denominations of U.S. dollars and hide a $50 inside a very unlikely place (get creative!) in your luggage. Credit cards are mostly only useful in bigger cities such as Manila and Cebu. They'll also work in busy tourist areas such as Boracay. Credit cards come in handy for booking short domestic flights and for paying in upscale hotels. You can also pay for diving courses by credit card. For daily transactions, plan to depend on cash. Many businesses charge an extra commission of up to 10% when you pay with plastic. MasterCard and Visa are the most accepted credit cards in the Philippines. Tip: Remember to notify your ATM and credit card banks so they can place a travel alert on your account, otherwise they may deactivate your card for suspected fraud! Acquiring and hoarding small change is a popular game in Southeast Asia that everyone plays. Breaking large 1,000-peso notes — and sometimes 500-peso notes — fresh from the ATM can be a real challenge in small places. Build up a good stock of coins and smaller denomination bills for paying drivers and others who often claim not to have change — they hope you will let them keep the difference! Using large denomination notes on buses and for small amounts is considered bad form. Always try to pay with the largest banknote that someone will accept. In a pinch, you can break large denominations in busy bars, fast food restaurants, some minimarts, or try your luck in a grocery or department store. Haggling is the name of the game for much of the Philippines. Good negotiation skills will go a long way to helping you to save money. Unlike the etiquette for tipping in much of Asia, the rules for tipping in the Philippines are a little murky. Although gratuity generally isn't "required," it is greatly appreciated — sometimes even expected — in many circumstances. In general, try to reward people with a small token of appreciation who go the extra mile to help you out (e.g., the driver who carries your bags all the way to your room). It is common to round up fares for drivers and maybe even give them a little something extra for friendly service. Don't tip taxi drivers who initially balked at your request to turn on the meter. Many restaurants tack a 10 percent service fee onto bills, which may or may not simply be used to pay the staff's low salary. You can leave a few extra coins on the table to show thanks for great service. As always, choosing whether to tip or not requires a bit of instinct that comes with time. Always filter the choice through the rules of saving face to ensure that no one is caused embarrassment. The Ringgit - Don't Travel in Malaysia Without It! How Much Does It Cost to Visit Asia? Not as Much as You Think! Would You Seek Out the 'Witchdoctors' on Siquijor Island?